Custom designing jewellery, whether it is an engagement ring, wedding band or a special gift for your loved one, can be an exciting and overwhelming task. There are so many ways to create a unique style; whether you choose to add diamonds or gemstones, combine different coloured metals, include engraving into your design, or add traditional techniques like milgrain and filigree to create a vintage look. The list goes on and the options can seem endless. One other element that plays a major part in the final design is the surface finish of your piece. There are different techniques used to create varied appearances and textures on the surface of the metal, independent of the colour of the metal itself. It is important to remember that any surface treatment or finish will wear over time. 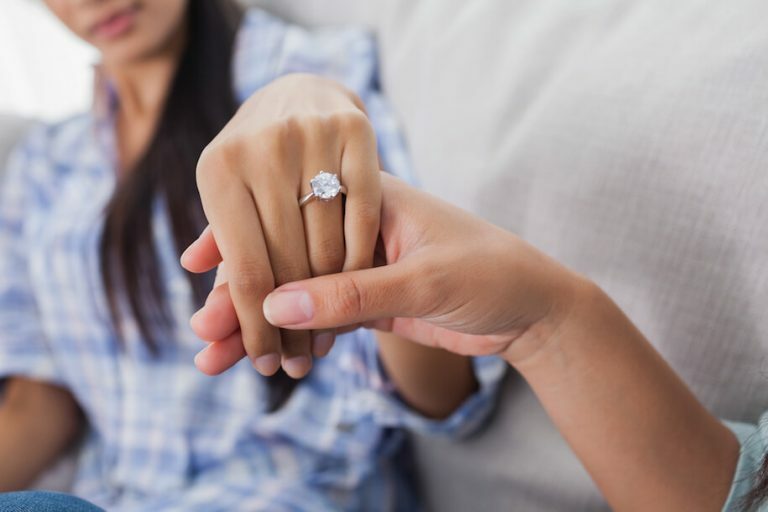 With any significant jewellery purchase it is important to take your piece in for regular check-ups, just like you would with any other significant purchase, such as a car. Your jeweller will check that your stones are nice and secure, give your jewellery a clean and touch up your chosen finish. High Polished: This is arguably the most popular and involves removing any marks and scratches from the surface to achieve a mirror finish. Matte: A matte finish creates a lovely flat look. You can use different textures to create heavier and lighter finishes. A matte finish also looks fantastic when contrasted with a high polish. For example, you may want to combine a high polish engagement ring with a matte finish wedding ring. Or contrasting finishes on a gents wedding ring look great, such as two-thirds matte and one third high polish. Hammer-tone: A hammer-tone finish is a wonderful, textured, beaten look. Different hammer shapes and sizes will create a different look. You can achieve small round dents or larger, dish shaped dents. Light can reflect beautifully off the different level surfaces. A hammer-tone finish is also a great option for those whose work involves heavy lifting or anything where your ring is exposed to frequent knocks. Any marks will be less obvious and will only add to the beaten look. Sandblast Finish: A sandblasting machine is used to create this beautiful, textured finish. Small particles of glass and sand are literally blasted at the surface of the metal. The depth of the achieved finish is determined by how much force is used to blast the particles. Sandblasting creates an even, textured look over the whole surface. When deciding on the finish of your jewellery ask your jeweller to show you different examples. Remember surface finishes are temporary. If you decide, for example, that you prefer a polished surface to a matte finish, this can be very easily applied for you.